Moody and Romantic "Wild Bohemian" Fall Inspired Wedding Editorial at Stonewall Ranch, Planned & Designed by Art & Soul Events, Photographed by Evangeline Lane, Floralized by Winston & Main, and featured on Green Wedding Shoes! Stonewall Ranch is a breathtakingly beautiful new wedding venue located in the hills of Malibu, California. 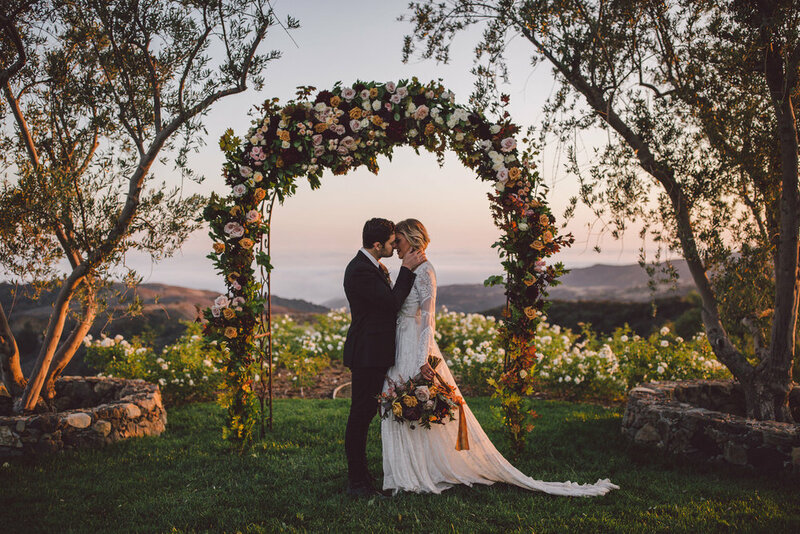 The Ranch has multiple locations with incredible views, a winding rose garden, a charming cottage (to stay the night or get ready in), a sprawling reception lawn with a bocce ball court, a pond with koi fish, and a scenic ceremony overlook perched on top of a hill with the best view in Malibu. Evangeline brought this incredible venue into my world when she asked me if I might want to plan a shoot there. WHY YES, I SURE DID!! I quickly jumped on board and we built a team of creative rock stars to bring our wild & romantic boho vision to life. We wanted to show off a dramatic and moody side of the ranch in a rich and earthy fall color palette. I hope you love this editorial as much as we loved creating it. DREAM TEAM STATUS ACHIEVED!! If you are not a romantic, you will be after you see Evangeline Lane's incredible photos. She stunningly captured Andi + Brett's sweet love and affection through her rose-colored glasses (or should I say rose-colored lenses?). Andi + Brett are recently engaged and they got to experience a unique behind the scenes perspective of a day in the life of creative wedding professionals. We are so thankful that they allowed us to share a piece of their love story with you. Winston & Main's floral creations will blow you away! 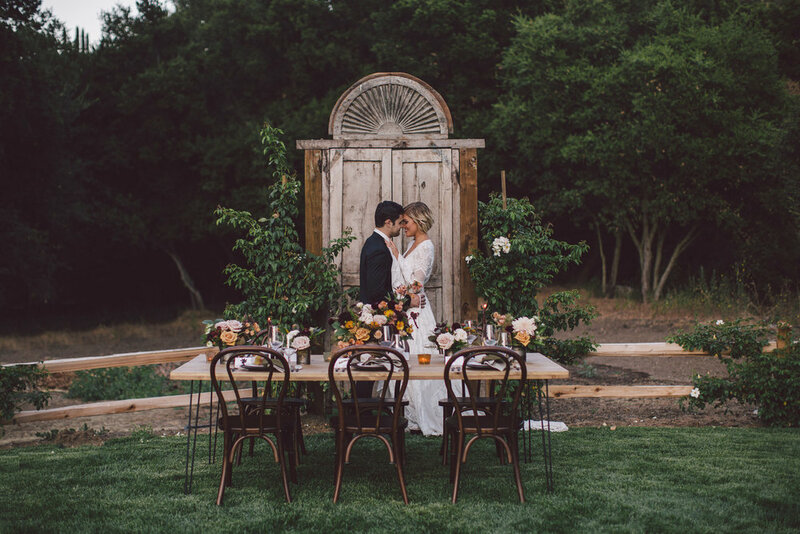 Tabitha designed a wild and textural boho wedding bouquet, a 5-piece dinner table arrangement, and she transformed an old wooden wheelbarrow into a spectacular floral carpet that luxuriously spilled out onto the ground. She later repurposed the wheelbarrow flowers and moved them up the hill to the ceremony location. Tabitha created a dramatic showstopper floral installation on the venue's large iron ceremony arch with lush fall flowers and Maple leaves. When I first saw the finished ceremony arch, in all its glory, I COULDN'T HELP BUT CRY!! Let me set the scene for you... Dreamy clouds rolled in just in time for our sunset ceremony portraits and Stonewall Ranch looked like heaven on earth! There we were, a handful of badass creative women, joined by two lovebirds, shooting at the top of a beautiful scenic mountain, creating ART together. I was truly moved by the beauty and magic of the moment. In preparation for our shoot, Winston & Main dried & pressed flowers to incorporate into our stationery, signage, and cake designs. Tabitha handmade our invitation suite and customized the envelope liner by photographing the collection of flowers she had dried for our bar signage and name cards. In an effort to be as eco-friendly as possible we can proudly say that there was no green floral foam used in this shoot thanks to Tabitha! The moment I saw those doors, I knew I wanted to set a dinner table in front of them. I wanted to showcase an elevated, modern, and earthy dinner tablescape with neutral fall tones, bold and moody W&M florals, dip-dyed napkins, and pressed flower name cards. I designed the dinner table setting featuring La Pinata Party Rentals wooden farm table with black hairpin legs, bentwood bistro chairs, heirloom ceramic dinner plates, wooden napkin rings, classic stemware, and modern black & gold flatware. Nicole Bakes Cakes created a 3-tier textured buttercream cake to mimic the look of painted & pressed flowers, she then added a few of Winston & Main's pressed and fresh flowers onto the cake. Don't you love how this turned out?! The Old Fashioned Caravan bar drove out to the Ranch and made us three fall-inspired signature craft cocktails. A Rye Manhattan with Candied Blood Orange, a Lavender Paloma, and a Rosemary Blood Orange Negroni. 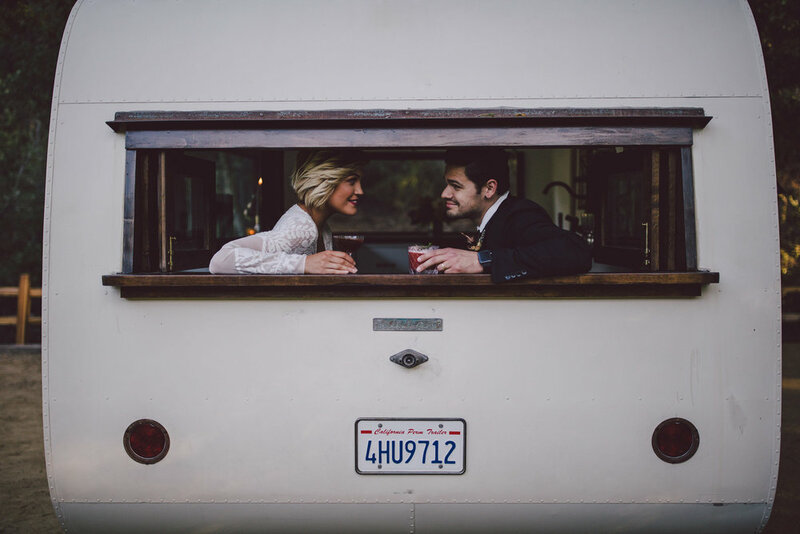 Andi wore the "Wild Harlow" Rue De Seine wedding dress from Lovely Bride in Pasadena. Elwynn + Cass supervised beauty planning and Andi's Hair & Makeup was styled by Jackie Romero. The Boho wedding necklace was from Free People. Design & Planning: Art & Soul Events • Photographer: Evangeline Lane • Floral Designer, Invitation Design, & Signage Floral Styling: Winston & Main • Rentals: La Pinata Party • Bar/Cocktails: Old Fashioned Caravan • Cake Designer/Pastry Chef: Nicole Bakes Cakes • Dress Boutique: Lovely Bride • Dress Designer: Rue De Seine " Wild Harlow • Hair & Makeup: Jackie Romero • Beauty Planning: Elwynn + Cass • Signage: Heirloom Paper • Featured on Green Wedding Shoes! If you loved our Wild Bohemian Editorial at Stonewall Ranch you will probably love Julie & Shane's romantic boho wedding at Rimrock Ranch!